Zoom-zoom! For a limited time, Amazon itself is offering the new condition Panasonic ZS60 travel zoom in the black color scheme for $250 with free shipping with up to three cameras per customer at the sale price. This is a limited time offer but not a lightning deal, so there’s no ticking clock on the offer. Adorama does not have conventional daily deals but on occasion they have “snapshot deals” which are limited time offers… One such offer running right now is the new condition Kodak AZ652 superzoom going for $300 with free US shipping… This has a 65x optical zoom with OIS (24-1560mm EQ, f2.9-6.7), 5fps, RAW but on a 1/2.3″ backlit CMOS, flip-out LCD, 1cm macro, EVF, Wifi, 400 CIPA, 21oz body-only, etc. 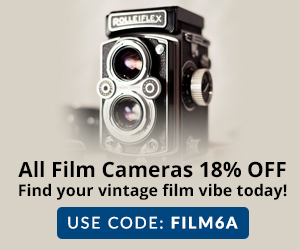 In addition to the previously mentioned Fuji X-T2 deal, the Amazon USA Gold Box has a number of other photo-related offerings of a more general interest including the new condition Fujifilm Instax Mini 26 + Rainbow Film Bundle going for $40 with free shipping. The promotion is available on four different color schemes of the camera, with up to three per color per customer. I’m not sure if it’s an overall limit of three, or three per color. I have not attempted to buy them all 🙂 The rainbow pack is 10 exposures. Sale ends Saturday at 11:59pm pacific time or earlier if sold out. Shortly after marketing departments tire of the Black Friday and Cyber Monday verbiage, it’s time for the “X Days of” type of marketing. Which brings us to Best Buy, morphing their daily deals into their 20 Days of Doorbusters. Among the current offerings there, you can get the new condition Polaroid Originals OneStep 2 VF Analog Instant Film Camera [it could use a better name] going for $90 with free shipping or free store pickup. An instant camera doorbuster at B&H Photo, for a limited time only, for $40 with free shipping you can get the new condition Fuji INSTAX Mini 70 Instant Film Camera in the gold color scheme. It also includes a 10-pack of exposures (NYC first edition). … the new condition RX 10 Mark IV is now down to $1598 at authorized Sony dealers such as Adorama (with 1% rewards, 32GB Extreme PRO, Corel software, 72mm MC UV, etc) and Amazon and B&H Photo (with free bag and 64GB Extreme SDXC)…. At Adorama you can get a handful of free accessories included by Adorama automatically during this promotion, including the Corel software bundle, Lowepro bag, 16GB Lexar SD, etc. At B&H Photo you get a 32GB Sandisk Extreme SDHC card and a camera bag. The Sony RX10 Mark IV is the leader of the RX10 series but with a price that is not that far from 2000 (Euro or Dollars), one who loves the idea of the RX10* models but has a fiscally strict spouse-CFO may be interested in the original model, the first generation RX10, it is currently on sale in new condition for 650 euro by Amazon Germany itself with a maximum of two units per Amazon account at the sale price. As part of the 20% off in-shopping-cart (no coupon needed) Amazon Warehouse Deals sale, you can get the USED Sony RX100 Mark V for $628~ with free shipping. The price drops automatically after you add it to the shopping part from $786~. This is in “Used – Very Good” condition. Only the options sold by Amazon Warehouse Deals itself are eligible. The new condition Panasonic ZS100 superzoom goes for $550 at authorized dealers such as Adorama, but if you are comfortable with used, you can get it for $366 in “Used – Very Good” or $387 in “Used – Like New” condition at Amazon Warehouse Deals (AWD) thanks to a limited time 20% off in-cart discount for items sold by AWD actual. This link shows other sellers as well (included for reference and price-comparison). 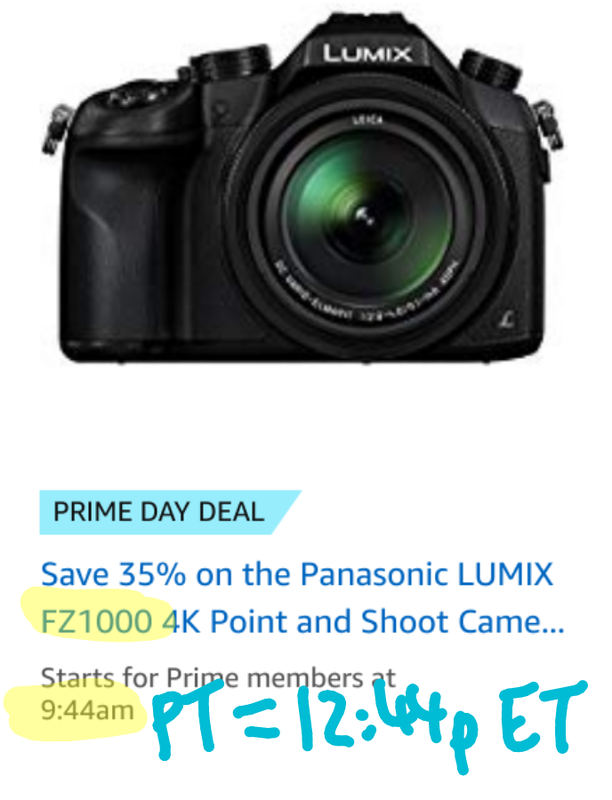 Among the cameras participating in the previously mentioned earlier today 20% off Earth Week promotion at Amazon Warehouse Deals is the Panasonic LX10 in “Used – Very Good” condition going for $360 with free shipping sold by Amazon Warehouse Deals itself, or $385~ in “Used – Like New” condition. The automatic in-cart discount only works when the seller is “Amazon Warehouse Deals” itself, and not 3rd-party sellers. The previous link shows only the Warehouse Deals itself offers. This link shows other sellers as well (the “default view” as determined by Amazon’s algorithms/bots). Among the cameras participating in the previously mentioned earlier today 20% off Earth Week promotion at Amazon Warehouse Deals is the Sony RX100 Mark V, dropping from $850 to $680 with free shipping in “Used – Like New” condition with pictures of the offered cameras in the individual listings over there. The Panasonic FZ1000 superzoom went for $700 last month when we posted the Fixed Lens Cameras price charts but as of this recheck, it is down to $600 with free shipping by various at Amazon and Adorama (with free accessories: 64GB Sandisk Extreme PRO SDXC, extra battery, camera bag, filter kit, etc). The Canon G5 X goes for $730 in new condition at authorized Canon USA dealers, but thanks to the magic of mail-in rebates, if you don’t object to the paperwork and if you also want/need a printer, then off to B&H Photo we go where they are bundling the Canon G5X with the Pixma PRO 100 printer and its trusty sidekick (50pk SG-201 photo paper) for $649 after a $350 mail-in rebate (prepaid AMEX gift card). Free standard shipping. Earlier in the month Adorama offered this with a $100 gift card and $22 promotional rewards VERSUS B&H offering now a $50 Gift Card and the 32GB Extreme SD and the official Panasonic travel charger/battery kit. PS: a few days ago Panasonic revealed the new ZS200 which is available for pre-order for $800 without any freebies. Fuji has cut back on the number of fixed lens X-series cameras it is making and as of the time of writing (price-check for the upcoming Fixed Lens Cameras Price Chart) the Fuji X70 is gone and cannot be ordered at Adorama and B&H Photo. It is still orderable at Amazon by Amazon itself at its typical price of $700. It is in the all-encompassing “temporarily out of stock” status, so shipping estimate is unknown.